Little Wonder equipment has been supporting groundskeepers since 1922. Whether its cutting neat edges, keeping hedges trimmed and the landscape under control, nothing beats the durability and dependability of Little Wonder. Are you looking for a landscape or debris handling equipment rental dealer nearby? Whether you’re a contractor who needs to rent tools for seasonal work or a homeowner with too many leaves to handle with a rake, we have the power equipment to handle the job. Little Wonder Optimax Blowers, Vacuums and the Pro Crack Cleaner are “go-to” power equipment for the Asphalt & Paving industry. Whether you’re seal coating a driveway or clearing debris for pothole repair, you can depend on Little Wonder outdoor power equipment to get the job done thorough, fast and easier. 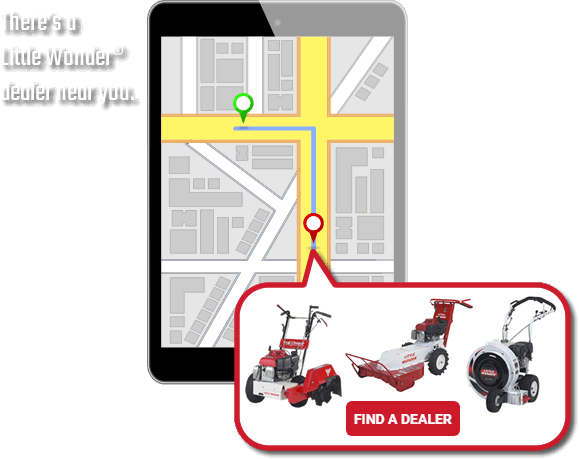 Try Little Wonder for leaf and debris cleanup this season, visit our dealer locator to find a rental center in your area. Little Wonder is the proven industry leader in outdoor power equipment for debris management, grounds maintenance and asphalt & paving equipment. We design and develop the most rugged, durable and productive landscaping and grounds maintenance equipment in the industry. In fact, we offer more debris management products than any other manufacturer in this category, including our famous line of Optimax walk-behind blowers, Pro vacuums and industry leading TruckLoaders.